I am a textile designer and an artist of arts and crafts. I am a textile designer and an artist of arts and crafts. I design and sew works of textile art for both private residence and public premises. Textiles for Churches are my specialities. I take part on exhibitions and have ones of my own. My techniques are application, free machine embroidery and textile collage. I call it painting by sewing machine. The yarns are my colours and the needle is my brush. The tiny yarns have special power. The yarn is three-dimensional, it has the twist and the beautiful shine. When I sew hundreds of tiny twisted yarns together, the power and the three-dimensional effect of the yarns will strengthen. The picture is very lively, when the light reflects from the yarns and gives power to the whole works. My ideas come from nature, water, summer, joy of life, children, garden, flowers or just everyday life´s things. I am very interested in folds of the clothes, shadows and lights. I want to represent fabric by fabric; to sew pictures where human is wearing shirts and coats and to see the three-dimensional movement of the fabrics by painting sewing machine. I want to share the feelings of joy and beauty through my works to people. I consider top class quality very important in my designs and works of textile art. I have my own design company, called Textile Design Helena Vaari-Silventoinen, studio is next to my home. Helena Vaari also designs ecclesiastical textiles, where the symbols and stories make an essential element. A leaf, for example, symbolizes the beginning of new life. These symbols come from the Bible. Each church is one of the kind and therefore these textiles are unique taking into consideration the architecture and the interior of the church. 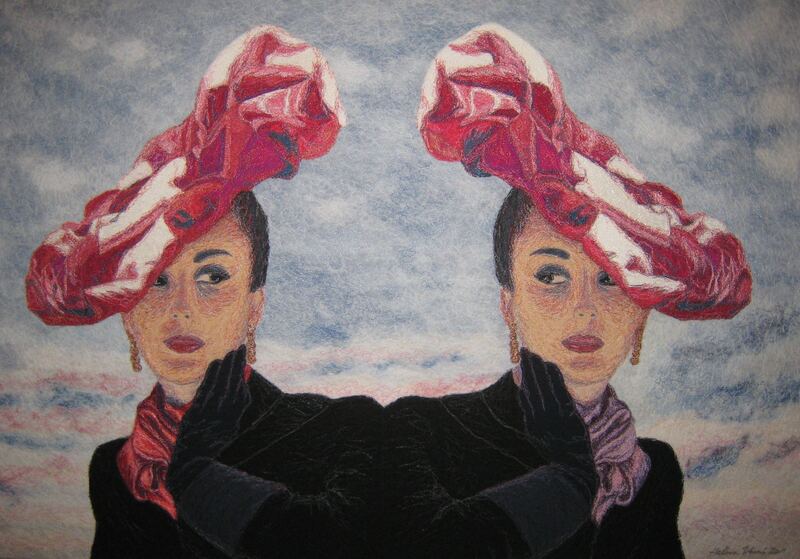 Helena Vaari’s techniques of making art are application, machine embroidery and textile collage. She calls it painting by a sewing machine. The yarns are her colours and the needle is her brush. This technique is unique in Finland. She is very interested in the folds of the cloth, its shadows and light. She wants to represent fabric by fabric; to sew pictures with people wearing shirts and coats and to see the three-dimensional movement of the fabric. The tiny yarns have special power. The yarn is three-dimensional; it has twists and a beautiful shine. When hundreds of tiny twisted yarns are sewn together, the power and the three-dimensional effect will strengthen. The picture becomes very lively, when the light reflects from the yarns and gives power to the whole work. When the viewers are looking at these unique works of art, they can make their own interpretations. The artist simply wants to bring beauty and joy of life into people’s minds. next to my home. My artist name is Helena Vaari. Address: Kylvötie 6, 15860 Hollola, Finland.